Growing parsley in your garden lets you maximize the wealth of vitamins (B, C, and K) that this herb packs. Parsley can be sown as a thick, green herbal edging for your herb garden, or inter-planted with quick growing cool-season veggies like radishes or lettuce. Parsley will help these plants by loosening and preparing the surrounding soil. 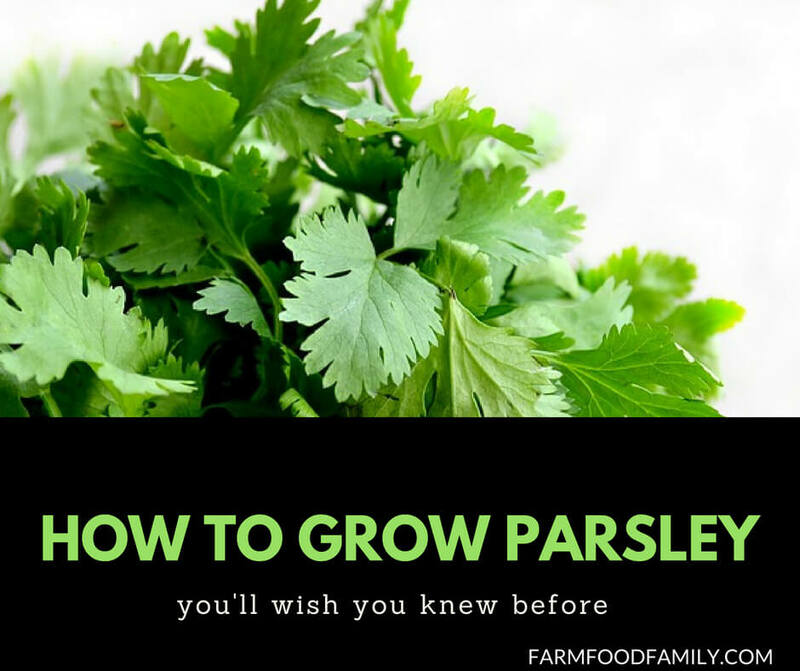 Below you will find a description of the parsley plant, including its height, hardiness, and flower; light, moisture, and soil requirements ; cultivation tips for keeping your growing parsley healthy and tasty; our favorites varieties; and some ideas for how to use parsley in your home. Both flat and curly leaved parsleys pull a quick change act between the first and second years. The first year, growing parsley will top out between 6 and 12 inches, both tall and wide. Cute, appealing, tasty. The second year, parsley booms! And blooms! 18 to 24 inches tall and nearly as wide, the sweet herb of last year becomes a fountain of clusters of lacy, appealing yellow flowers. Lush, elegant, bitter. The third year… there is no third year. Parsley is a biennial at best. Light: Part to full sun. Anything from 4 hours up ought to work just fine. Moisture: Moderate moisture, neither extreme. Soil: Anything really, as long as it drains well. Starting from…: Seed or Seedling. Germination from seed can be inconsistent, but if you start from seed you know you can get two years out of it. Soak your seeds in warm water over night, give it at least 4 weeks to germinate, and make sure to start relatively early in spring; 6 -8 weeks. Also, use at least 4” deep containers as Parsley has a relatively long taproot. Growing Parsley: Plant enough to accommodate the voracious appetite of the Black Swallowtail (Papilio polyxenes) caterpillar! For yourself, if the leaves become tough and course in the heat of summer, cut it all back, water well, and allow the plant to produce a new flush of sweet and tender leaves. Especially important in the second year: if you want to keep eating from this parsley plant, then be sure to cut the flower stalk before it matures. This will extend the life of the plant, which will die either way at the end of that second year. No, you didn’t kill it. If you have given it up to seed and are eating from a different plant, then sit back and watch the flowers! Never done this before? In the early spring of the second year, move the parsley back to the fenceline or another out of the way setting. It gets huge when it blooms. P. crispum is your tender, garnish-quality, curly-leaved parsley. Italian parsley, P. crispum var. neopolitanum, is your more cold-hardy flat-leaved parsley. Most famous as a garnish, parsley is used in spaghetti sauces, on steamed veggies, worked into bread, and as the savior of any dish you accidentally put too much garlic into. It’ll cut the harshness without hurting the flavor. Hint! When parsley arrives as a garnish on your plate, save it for the end of the meal. It’s a natural breath freshener.